Eight cups seem to spring out of a dark ocean. The darkness is intensified by dark clouds looming above. Many 'vacant holes' on the ocean surface seem to suggest there were more cups like these here. (Or there are going to be more cups? I dont know for sure. It appears there were.) Three cups are finely poised on lotus leaves. 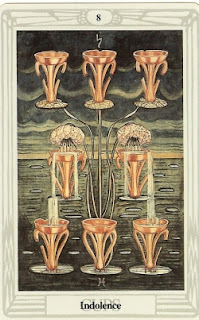 Two lotuses bend downwards to two more cups and water/nectar appears to flow out of them into these cups. They are in fact overflowing into two more cups below. Overall, it seems to depict abundance. 'My cup of joy is flowing over.....' But then, I have no enthusiasm to pick up any of these cups, leave alone drink from them. It all seems so, well, momentary and transient. How soon would all the cups become empty and possibly vanish, to leave more such gaping holes in the surface of the ocean. How many such cups has the ocean swallowed already? The picture is fascinating enough to get my attention riveted for some time, but only so much. Thus far and no further. There are other things that call me, and I must go. If I look at whatever I have gained after years of labour, what does it all look like? How much of it is still worthwhile? Is there something which has lost its meaning? Am I hanging on to things just because they are mine? What if all this suddenly disappears or is taken away from me? Would I really feel sad? I will feel sad, yes. But devastated, no. Sometimes in the world around us, the one we have created for ourselves, everything looks perfect. But one knows inside that the time has come to move on. Crowley calls it 'indolence' - which is being beyond grief or joy. I suppose thats the state of being a 'stitha pradnya' as described in the Bhagavad Gita. What do I need to let go? What holds me back?